The Best Orphan blogs from thousands of top Orphan blogs in our index using search and social metrics. Data will be refreshed once a week. Gridley, IL About Blog Lifesong for Orphans exists to bring joy and purpose to orphans. Our Method: We seek to mobilize the church, His body, where each member can provide a unique and special service: some to adopt, some to care, and some to give. Follow our blog for adoption testimonials, resources, orphan stories & latest happenings. Facebook fans 41,515. Twitter followers 1,971. Franklin, TN 3 About Blog Show Hope exists to mobilize individuals and communities to join God's revolution to care for orphans in their distress, helping to provide waiting children with food, shelter, medical care and forever families. Follow our Blog to learn more about what we do and who we impact! Facebook fans 135,710. Twitter followers 21,349. Banbasa, India About Blog The Good Shepherd Agricultural Mission is a orphanage home for Children in North India. We have around 100 kids and give them the love, support and guidance they need to become great people. Mission is to care for the abandoned children of India and Nepal. Facebook fans 7,303. Twitter followers 41. USA & International About Blog Orphan's Promise comes alongside orphanages, churches, and ministries already established in very poor areas maximizing the opportunity to help even more abandoned and abused children. We are a non-profit born out of a desire to give orphaned, suffering, and helpless children around the globe the help they need. Together we can give them hope. Facebook fans 15,518. Twitter followers 1,260. Mexico, Nigeria, India, Haiti About Blog Back2Back Ministries is an international Christian non-profit organization that is dedicated to being a voice for orphans. We exist to love and care for orphans and impoverished children, by meeting their physical, spiritual, educational, social and emotional needs that they might overcome their life circumstances and break free from the cycle of generational poverty. Facebook fans 15,860. Twitter followers 2,522. Washington, DC About Blog Coptic Orphans is an award-winning international Christian development organization that unlocks the God-given potential of Egypt's most vulnerable children through the power of education. Mission to unlock the God-given potential of fatherless children facing extraordinary challenges in Egypt, and so equip them to break the cycle of poverty and become change makers in their local communities. Facebook fans 75,545. Twitter followers 6,366. UK About Blog Orphans in Need is a charity dedicated to supporting vulnerable widows & orphans, empowering and nurturing them to lead fulfilling lives. Stay up to date with the latest orphanage developments, fundraising events and challenges, and what Orphans in Need are doing with your help and donations. Facebook fans 52,098. Twitter followers 9,656. Austin, TX About Blog Miracle Foundation is a non-profit organization that brings life-changing care to the world’s orphans. The Miracle Foundation empowers orphans to reach their full potential. We stand for orphaned children and helps them thrive in real time. We've created a measurable, repeatable and systematic method to ensure that orphans. Facebook fans 16,005. Twitter followers 987. About Blog Stahili Foundation is a volunteer-driven, non-profit organization that combats child exploitation and poverty and promotes sustainable change in rural Kenya through a commitment to education, communities, and love. Facebook fans 2,073. Twitter followers 465. Kalispell, MT About Blog Orphan's Lifeline International is a non-profit working to care for the world's orphan children. Currently serving thousands of orphan children in 9 countries. Mission is to bring hope to the Orphans of the world by providing food, shelter, medical care, children's Bibles, educational assistance, adoption advocacy and more. Facebook fans 2,824. Twitter followers 268. Rexburg Idaho About Blog OSSO stands for Orphanage Support Services Organization and we do everything possible to help children living in orphanages in third world countries. Help orphans worldwide reach their potential. Travel, go on adventures, and give your time to children in orphanages. Facebook fans 4,658. Twitter followers 14. New York, NY About Blog The Global Orphan Project is a global community caring for local children and families in crisis. By equipping local churches with tools and resources, we provide sustainable care for the world’s most vulnerable. Facebook fans 7,555. Twitter followers 2,539. Fallbrook, CA About Blog Christian ministry visits orphans and partners with orphanages. Volunteers go on mission trips to serve orphans through outreach, summer camps and advocacy. Read our blog for the latest stories and updates about our work with Chinese orphans! Facebook fans 5,454. Twitter followers 397. Petionville, Haiti About Blog God's Littlest Angels is a Haitian orphanage located in the mountains above Petion-Ville, close to the village of Fermathe. GLA offers short term assistance to children needing a place to stay due to ill health or the death of a parent but who are not for adoption. Our purpose is to help the children of Haiti in any way we can and to spread the word of God to each person we serve. Facebook fans 11,721. Twitter followers 607. About Blog 147 Million Orphans Foundation, through the hope and love of Jesus Christ, provides for the basic needs of children living in poverty. We provide food, water, medicine and shelter in the name of Jesus Christ. The name of our company invokes discussion and brings awareness to the worldwide orphan crisis. Facebook fans 14,630. Twitter followers 6,143. Canada About Blog We tell stories. Our stories advocate for orphans, educate on orphan care, build community and inspire people into action. Facebook fans 7,777. Twitter followers n/a. About Blog Learn to do what is right. Seek justice, encourage the oppressed, defend the case of the fatherless, plead the case of the widow and orphan. Seattle, WA About Blog A Family for Every Orphan is a non-profit organization that helps orphans find loving Christian families in their home countries. Our vision is a World Without Orphans. Our mission is to help orphans find loving Christian families in their home countries. Facebook fans 4,237. Twitter followers 803. Bristol, TN About Blog Serving Orphans Worldwide betters the lives of orphans by rescuing struggling orphanages, training them and enabling them to pursue sustainability. Our mission is to empower these orphanages to better care for the children who depend on them every day. We ensure a healthy and nurturing environment for the children in the homes we support, enhancing their quality of life. Facebook fans 3,769. Twitter followers 1,418. Lake Forest, CA About Blog Saddleback Church is providing meaningful ways for every person to engage in caring for orphans through local churches at home and around the world. Find out how you can care for orphans in Rwanda and around the world through local churches. Facebook fans 2,041. Twitter followers 704. About Blog We’re a non-profit organization on a mission to build homes for orphans and provide orphan care around the world. Our desire is to see the children we serve receive the opportunity to be raised in a nurturing environment, obtain a proper education, learn trade skills, and receive medical care. Facebook fans 5,507. Twitter followers 355. Lakeland, FL About Blog Orphan’s Heart is working to improve the lives of disadvantaged and orphaned children in the Dominican Republic, Guatemala, Haiti, Honduras, Nicaragua, and Uganda through mission trips, child sponsorships, and support of special projects. We are on a mission to bring love and care to every child in need through international missions and child sponsorship. Facebook fans 5,604. Twitter followers 950. Castle Rock, CO About Blog Our Vision: To empower the church to care for orphans - until they all have homes! Our Mission: We equip, inspire, and mobilize the church to care for orphans and vulnerable children. Churches engaged. Children restored. Communities transformed by the Gospel of Christ. Facebook fans 9,943. Twitter followers 4,615. Manchester & Kenya About Blog The Good Life Orphanage provides a safe and secure home for orphaned and abandoned children in the Kikambala area of Kenya. Our aim was simple; create a charity where all funds raised go directly to keeping children happy and healthy. No administration, travel or accommodation fees. 100% charity. Facebook fans 2,261. Twitter followers 830. Dearborn, MI About Blog My Orphans is a Non-Profit Organization developed in response to the increasing number of orphaned children in war-torn and poverty-stricken nations. As an organization operating on a volunteer-only base across the United States and Canada, My Orphans is able to contribute 100% of all proceeds to assisting orphans. Facebook fans 684. Twitter followers 172. Tacoma, WA About Blog Orphans Africa (OA) is dedicated to the education of orphans in Africa. Orphans Africa envisions a world without poverty in which all persons have the freedom and opportunities to pursue happiness and maximize their potential. Facebook fans 1,021. Twitter followers 315. Louisville, KY About Blog Orphan Care Alliance’s vision is for the Body of Christ to lead the efforts of caring for the fatherless in Kentucky and Southern Indiana. It's more than education, it's about your heart's transformation. Let the Gospel transform your mind, soul and spirit for the families in crisis and their children. Our misson is to equips Christians & connects them to opportunities to care for the fatherless. Facebook fans 2,367. Twitter followers 1,852. Nottingham About Blog Operation Orphan is a charity seeking to create a brighter future for many of the orphans and vulnerable children in our world. For many of these children, education, employment and a decent standard of living are simply out of reach. Our vision is to improve the quality of life for orphans and vulnerable children in a holistic, culturally relevant and sustainable way. Facebook fans 2,397. Twitter followers 465. Austin, TX About Blog Our motto is simple: Serving Every Church to Reach Every Orphan. Caring for orphans is not optional. Hope for Orphans exists to mobilize the church and to help you bring the good news of the gospel to orphans at home and abroad. We provide gospel-centered videos, articles, curriculum, training, and events to equip churches and Christians to love and advocate for orphans. Facebook fans 12,366. Twitter followers 7,144. Monsey, NY About Blog Lev LaLev provides for the emotional, spiritual and physical needs of orphaned Israeli girls living at the Rubin Zeffren Children's Home in Netanya, Israel. We are so pleased to have you as a friend and supporter! Facebook fans 1,363. Twitter followers 261. South Korea About Blog Improving the lives of Korean orphans through outreach and education. Korean Kids and Orphanage Outreach Mission (KKOOM) is a US-based 501(c)3 nonprofit that leads volunteer projects to help kids and orphanages in South Korea. Facebook fans 2,918. Twitter followers 270. Virginia Beach/Nicaragua About Blog ORPHANetwork rescues abandoned and abused children, prevents vulnerable children from becoming abandoned, and raises every child up to new life. And while we're at it, we share Christ with everyone. Facebook fans 2,095. Twitter followers 1,297. Parker, CO 80134 USA About Blog We are a faith based group of staff and volunteers personally engaged in meeting the needs of each child in our care. Where no hope may have existed before these children now have an opportunity to experience hope and a future for their lives. Our mission is to provide loving support for Orphans fostering a greater capacity for physical, spiritual, and emotional healing and growth. Facebook fans 404. Twitter followers 35. About Blog Orphan Helpers is a multi-denominational Christian ministry dedicated to serving in government-run orphanages and detention centers in Central America. We empower today’s orphans to become tomorrow’s helpers. To serve and minister to the physical, spiritual, emotional, and educational needs of orphaned, abused and incarcerated children by effectively partnering with individuals, church. Facebook fans 3,190. Twitter followers 1,218. About Blog Starfish Orphan Ministry wants to bring about awareness to both the needs of Orphans and our Biblical responsibility as Christians to care for them. We encourage Christian families to adopt and foster children, but also understand that God has different plans for each family. Starfish strives to provide easy avenues in which any generation can help orphans both here and around the world! Facebook fans 2,389. Twitter followers n/a. Plano, TX and Romania About Blog Livada Orphan Care is committed to helping Romanian orphans find their place in the world, using a blend of Christian social work, humanitarian aid and ministry. Facebook fans 1,830. Twitter followers 448. Williamsburg, VA About Blog Heart For Orphans is a 501(c)3 charity who offers Transition Homes for orphan teens in Ukraine and the Former Soviet Union. Providing loving, nurturing Christ-centered homes for orphaned children. Facebook fans 1,142. Twitter followers 15. Sammamish WA About Blog We are a 501 3 (c) Nonprofit with a worldwide reach. Our mission is to help our partner organizations provide safety, shelter and sustainability for orphans. We raise awareness and funds for building projects that better serve orphans in their care. Facebook fans 659. Twitter followers 119. About Blog The Orphan Door’s vision is to be an active community impacting the lives of orphaned children. Mission is to build a community that is passionately devoted to loving, caring, and providing for children in need of an advocate. Facebook fans 629. Twitter followers 20. Mansfield, Ohio About Blog The Malawi Orphan Care Project exists to improve the lives of orphaned children and their caregivers. The Malawi Orphan Care Project works in partnership with community leaders in Malawi to address the physical, spiritual, economic and relational needs of the orphans and caregivers. New Zealand About Blog A New Zealand based non-profit organisation, helping to transform the lives of orphaned children in East and Central Asia. Blogging about supporting and raising funds for orphans in east Asia. Facebook fans 92. Twitter followers 20. 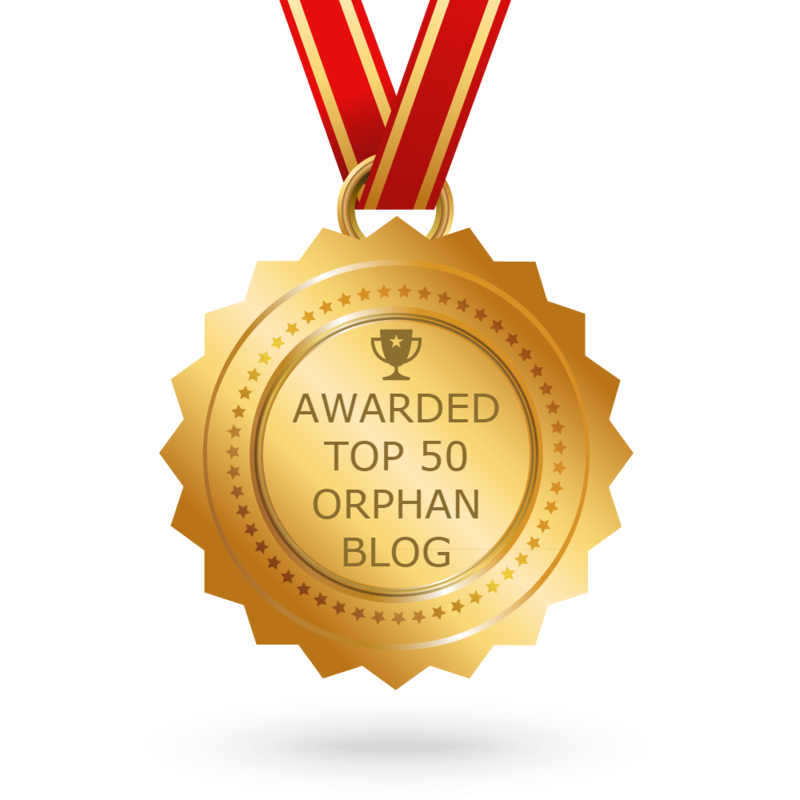 CONGRATULATIONS to every blogger that has made this Top Orphan Blogs list! This is the most comprehensive list of best Orphan blogs on the internet and I’m honoured to have you as part of this! I personally give you a high-five and want to thank you for your contribution to this world.